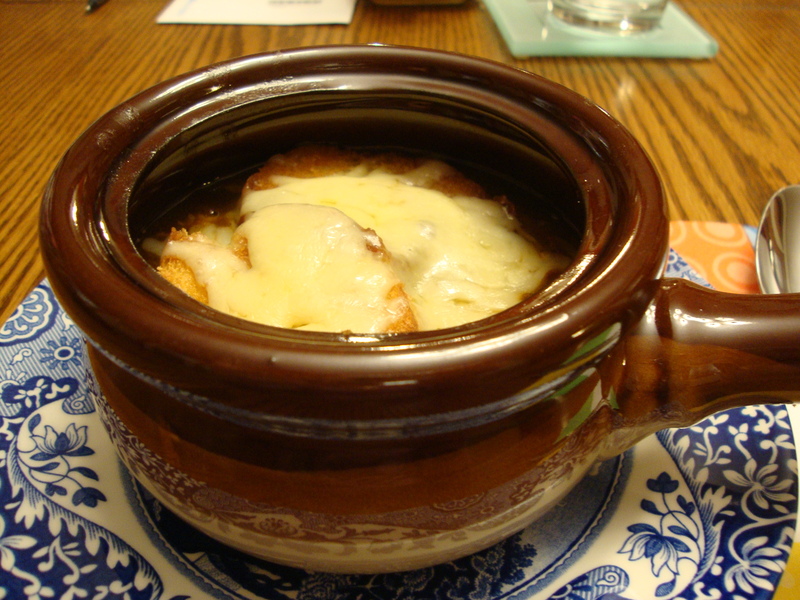 The first time I ever had French onion soup I was at my teacher Mrs. Mahoney’s house for a French Club holiday party – Yankee swap style. I was one of the only freshman there and felt really awkward. Would people want the gift I brought? Who can I talk to? What jerk stepped in dog poop and tracked it inside? Good GOD when did I step in dog poop?? How can I take my shoes off without making it obvious it was me who ruined her cream carpets? So many thoughts were racing through my mind (14 years later… sorry about the rug Mrs. Mahoney…). At some point in the evening she waved us into her open kitchen to start eating all the different foods she and her elderly mother had prepared for us. The two of them were French Canadian and I remember that her mother didn’t speak much English. 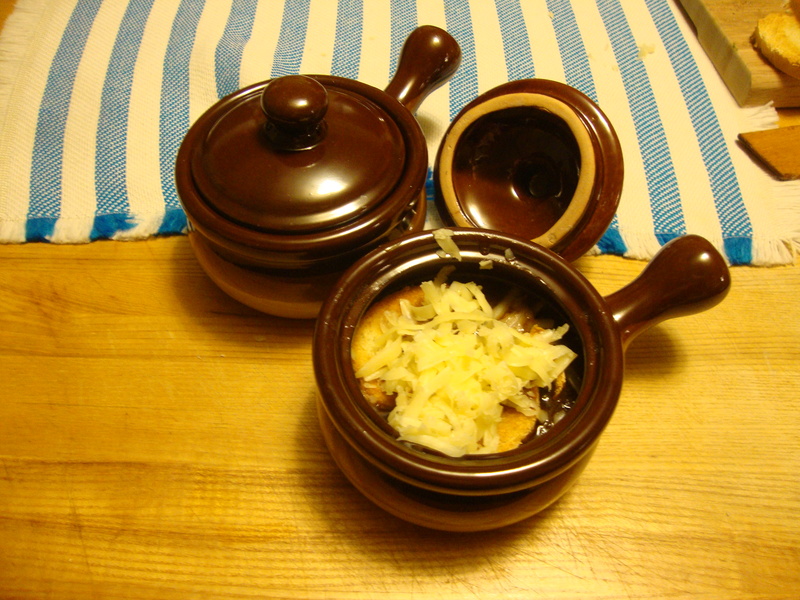 She pointed out a soup and gestured for me and my friend Kate to try it. 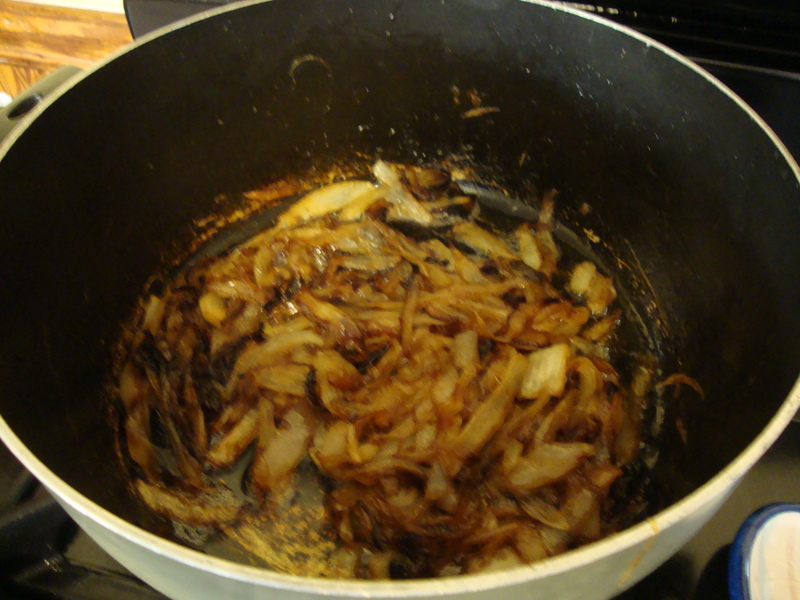 When I heard it was onion soup I remember thinking that sounded gross. At 14 I definitely wasn’t a vegetable eater and the idea of eating a soup that was named after a vegetable seemed really unappetizing/risky. I didn’t want to be rude though so I had a small bowl and couldn’t believe how delicious it was. I think I served a second bowl I liked it so much. It was love at first taste. 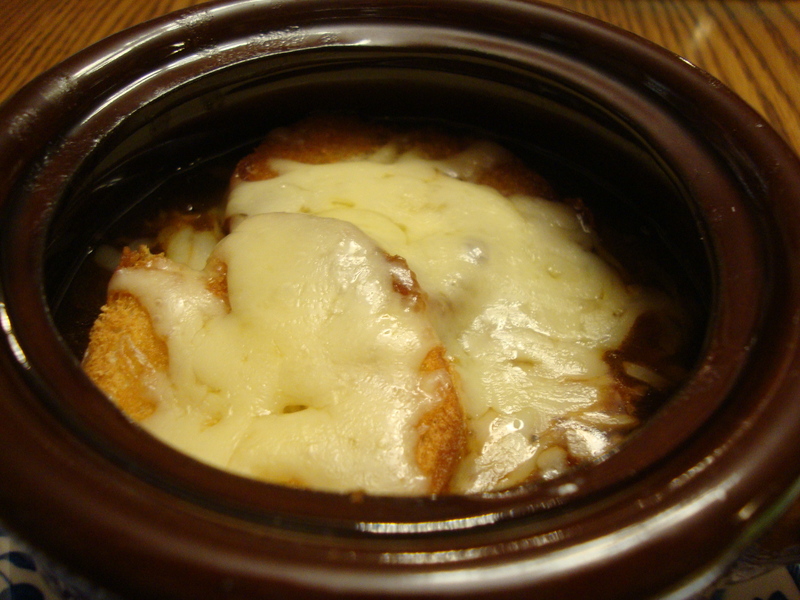 Since then I have had a few particularly delicious encounters with French onion soup. 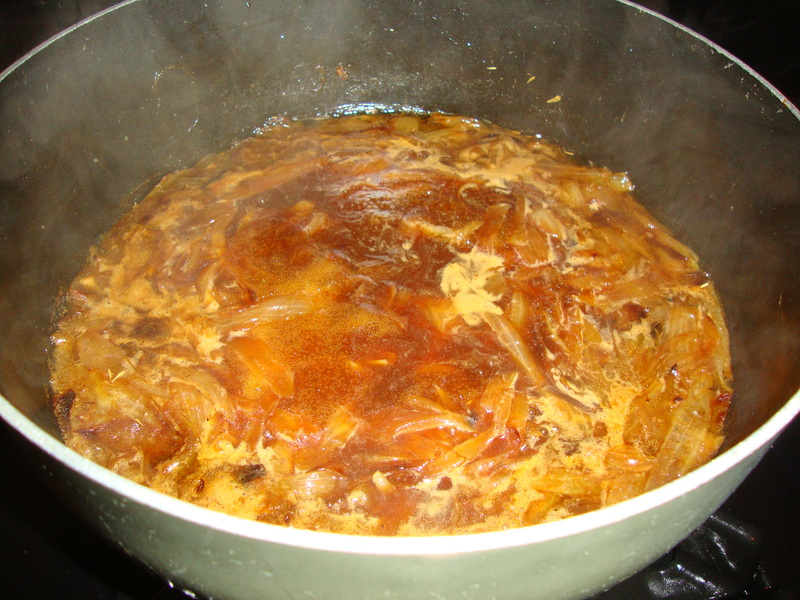 My ex’s aunt Ginny down in CT made a delicious treat at a party that was actually an entire onion that when you broke it up with your spoon would just fall apart and tasted exactly like the soup. I wish I knew how she did it. I think a bouillon cube was involved. My mom also works in a school with a culinary department and her coworker (who later became my sis’s father-in-law) has a delicious recipe that he makes around the holidays. It’s glorious. 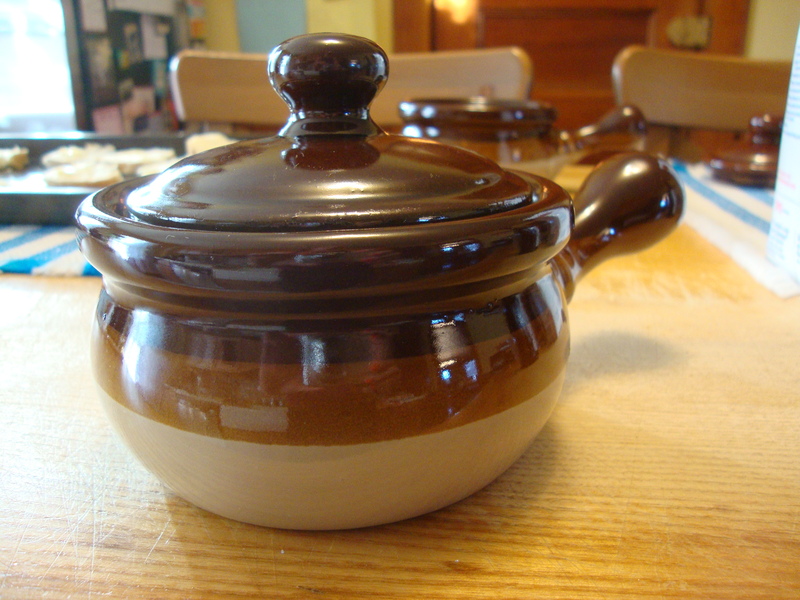 My mom knows how much I love French onion soup and bought me 4 beautiful French onion soup bowls when I moved last month and I’ve been excited to break them in. I combined 2 different recipes. The first is Martha Stewart’s which is the one my mom and Chef Courcy use. The other is Pioneer Woman’s. This recipe below serves 2 healthy portions. 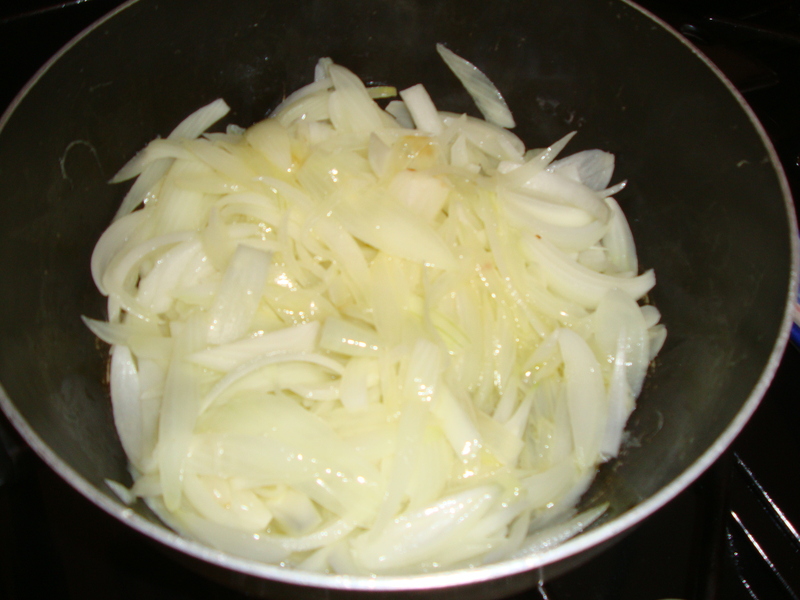 Please keep in mind that onions will shrink down quite a bit so it might seem like too much onion but its not. This will take you an hour and a half…but you don’t need to be standing in the kitchen that whole time. You can definitely do other things and come back and check on the soup. -4 yellow onions. Ends chopped off and sliced thin from end to end. First chop up your onions. In a large pot (dutch oven, le creuset, or any large stovetop pan with a lid) melt your butter over medium heat. I actually added a little olive oil too although now I can’t remember why. Throw in your onions. After a few minutes sprinkle in your sugar. 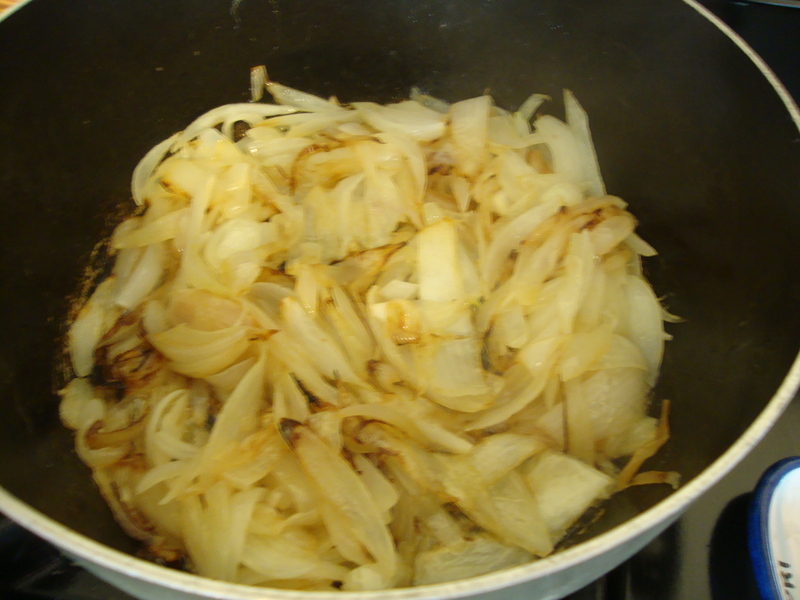 Keep the onions stove top without the lid for about an hour total. You will need to keep an eye on them and stir occasionally. 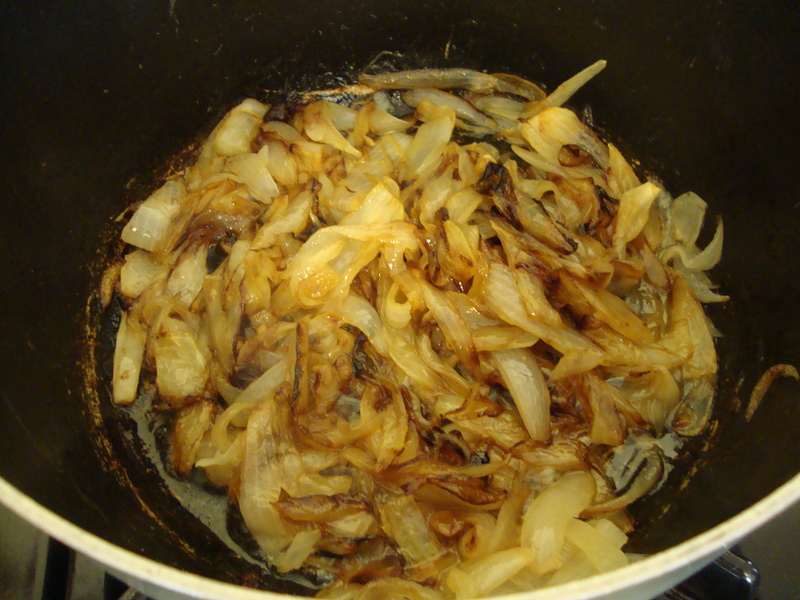 They will become a very nice dark brown and get much smaller when they caramelize (see photos below). Pioneer Woman recommends baking them in the oven for an hour to get a better brown color… but I found it worked great on the stove top. 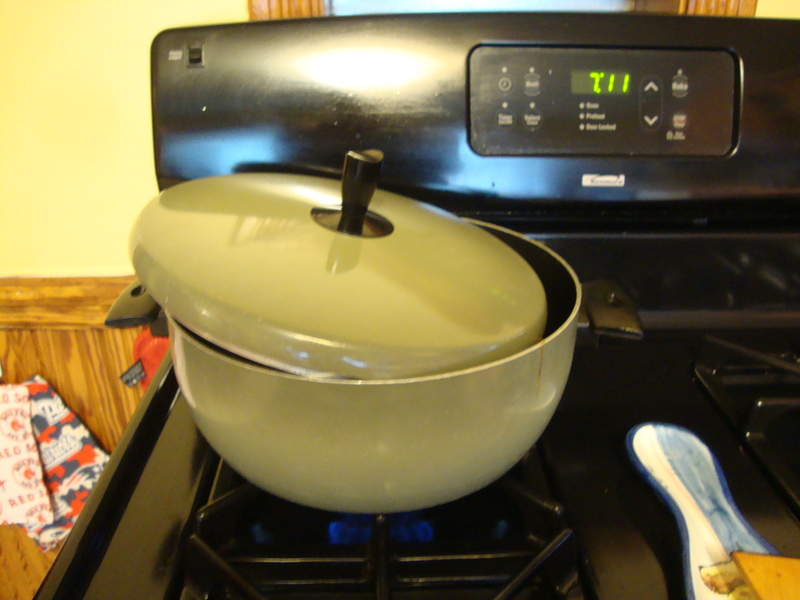 I didn’t have an oven safe pot that was the right size (my le creuset is small) so I kept it on the stove top, which is how Martha does hers. After an hour total on the stove top sprinkle in your flour and mix. 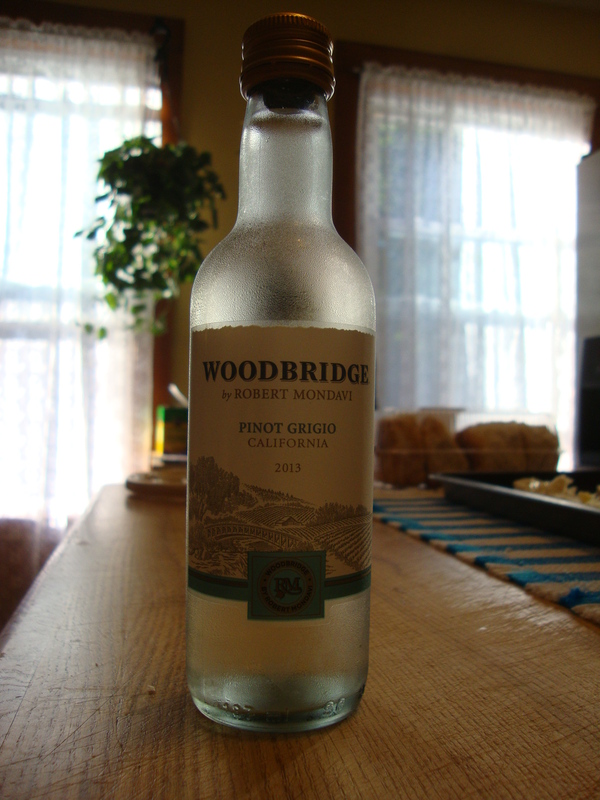 Add your wine (Pioneer Woman shuts her stove top off when she does this for safety reasons so I did too. Once the wine was in I turned the gas back on). Then add your beef broth, dash of Worcestershire, and thyme. Mix together. Get the soup simmering and put the lid on so the pot is only partially covered. You may need to turn the heat down a tiny bit if the simmer is a bit too aggressive. In the meantime, slice your french baguette into thin slices and butter one side. 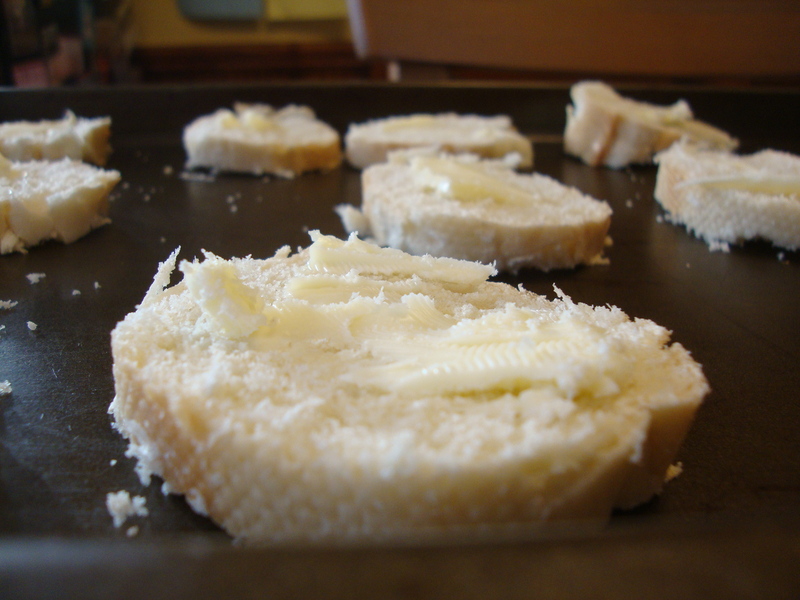 On a rimmed baking sheet place the buttered baguette pieces. About 5 minutes before your soup is done broil the bread for a minute or two to brown them. Keep an eye on them so you don’t burn them. Set aside. Grate your cheese and set aside (everyone I know seems to prefer Swiss but Gruyere is always a popular choice too). Once the soup has been simmering for about 30 minutes you can go ahead and shut off the stove top. Ladle into bowls and place 1 or 2 pieces of the toast on top. Then sprinkle on the cheese and broil until the cheese melts, about 1 minute. I used the same baking sheet my bread was on to place my bowls when I broiled again. You can always make extra of this and store it for leftovers.